India has enjoyed a bumper crop, with record high agricultural production in 2017–2018. India is the world’s largest producer of millets and the second largest producer of rice and wheat. But this doesn’t help a family living in a slum on the outskirts of Trivandrum, deep in the southern state of Kerala. Thankamani lives in a makeshift hut covered with tarpaulin. While smoke billows out of a small hole in the roof in the stopgap kitchen, Thankamani is cooking meagre portions of gruel and fish on a traditional chulha stove, fired by wood. This was all her husband, a daily wage labourer, could afford for six members of the family. But when her husband is unemployed, the family lives on an empty stomach. Thankamani’s family is among the estimated 190 million people who go hungry every day in India, comprising about 23% of the world’s undernourished population. According to World Bank data on least developed countries, India still trails more than a dozen countries on a number of key measures, while the Global Hunger Index 2017 ranks India behind several neighbours, including Nepal, Myanmar, Sri Lanka, and Bangladesh, even after improvement in recent decades. The contrasting scenarios of record agricultural production and grinding poverty illustrate what is described as the “paradox of plenty” in the agriculture sector. India wastes around food worth approximately $14 billion each year, according to government figures. Under legislation known as the National Food Security Act, millions of dollars are devoted each year to the Department of Food and Public Distribution, with subsidised grain delivered under a scheme via the Food Corporation of India (FCI). The FCI is entrusted to manage the national buffer stock to tide over emergencies, and for public distribution of food grains through a network of “fair price” shops to benefit the poor. But the FCI has a poor track record of storing and distributing food grains. Open storage of food grain is vulnerable to fungus and moisture, which not only deteriorates the quality but can harbour deadly disease. According to official data released by the Ministry of Consumer Affairs, almost 62,000 tonnes of food grain was damaged in FCI warehouses between 2011 and 2017. In 2016­-2017 alone, more than 8,600 tonnes of food grain was lost. Pests can be to blame, as are poor quality storage facilities that suffer water leaks. 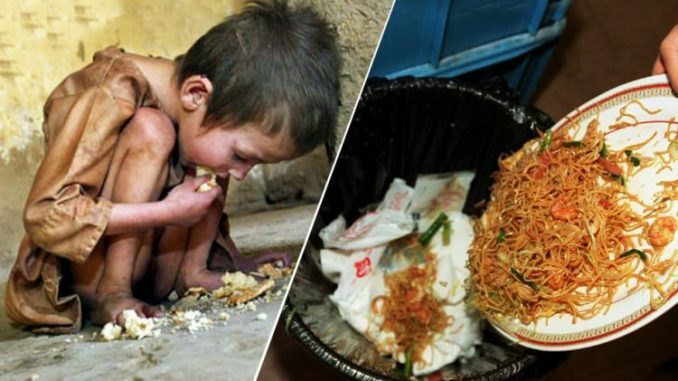 This waste of grains, mainly rice and wheat, is cruel in a nation with millions of poor. But this is only a fraction of the problem. The FCI often simply procures too much, far more than the current storage capacity allows. This forces the use of a cover and plinth (CAP) method, storing food grain in the open under tarpaulin sheets. It is estimated that around 30 million tonnes of food grains are stored across India using this open method. Such open storage is vulnerable to fungus and moisture, which not only deteriorates the quality but can harbour deadly disease, according to the World Health Organisation. About 1.8 million tonnes of grain spoils during open storage. Much of the damage occurs in the wait for transportation. In one instance, rotten grain was found buried at an FCI depot in Mulangunnathukavu, Kerala, sparking a public outcry. Authorities reported 1.5 tonnes of grain had been disposed of, having spoiled during transportation to the warehouse. But the rot is only part of the problem. Corruption via what is called “leakages” – where subsidised grain intended for the poor is actually diverted for sale on the open market – has in past years caused the loss of an estimated 25.9 million tonnes of rice and wheat alone, according to a study by the Indian Council for Research on International Economic Relations. When food grains do reach the fair price or ration shops, the distribution is also subject to bureaucratic barriers. Distribution is governed by ration cards, yet the complexities involved in applying for ration cards has turned away many intended beneficiaries, who are either illiterate or vagabonds with no fixed address. Often people with bogus or ineligible claims also seek to collect the subsidised grain, adversely affecting the public distribution. The government deleted around 28 million suspect ration cards between 2013 and 2017, an indication of the glaring loopholes in the existing system. There is no guarantee of good quality food grains reaching that the intended beneficiaries. Dealers regularly resort to unfair trade practices to inflate profits, selling fresh stock on the black market, and swapping low-quality grains to send to the poor. Recipients are often left to dump the poor-quality grains they are provided, further shackling them in the vicious cycle of hunger and deprivation. This government supply chain that wastes significant portions of its stockpiles and allows unscrupulous dealers and ineligible beneficiaries to take undue advantage of its loopholes is desperately due for an overhaul. The faster the change, the better for the poor and downtrodden of India.